Georgia isn't the only state where peaches reign as the "king fruit of summer." 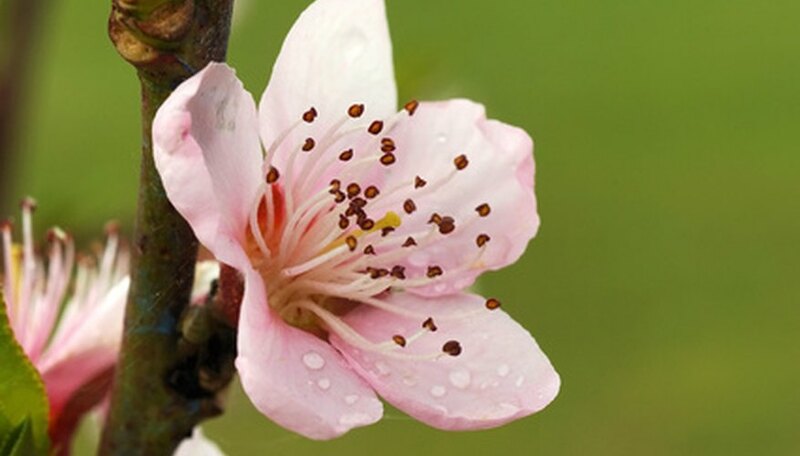 South Carolinians plant peach trees (Prunus persica) not only for their pretty pink springtime floral display, but also for the tasty cling or freestone fruits that ripen from May to early August. Grow a peach tree in lots of sunshine in a fertile, moist but well-draining soil. New and improved peach varieties pop up on the market annually, but rely on evaluations from local growers or Clemson University horticulturists for the best information. Peach trees typically are produced from cuttings grafted on to vigorous, disease-resistant rootstocks. Since seeds produce new plants with variable traits, cuttings ensure a specific variety's characteristics perpetuate in new, young sapling trees. The best rootstock for peaches grown in South Carolina is 'Lovell'. In the sandier soils in southeastern counties where nematodes pose problems, only choose peaches grafted onto either 'Guardian' or 'Nemaguard' rootstocks. Variety 'Redskin' is a good peach for culture all over the state, according to Clemson University. Its yellow flesh becomes reddened by the pit and tastes good fresh, frozen or canned. This peach ripens in mid- to late July. Nectarines are peaches lacking the fuzzy skin, so consider also growing the nectarine variety 'Redgold', which ripens its large fruits in early to mid-July. The mountains, Piedmont and inland sandhills of South Carolina away from the warm coastal plain are colloquially called the Upstate and Midlands. Yellow-fleshed peaches recommended here include 'Dixiered', 'Redhaven', 'Redglobe', and 'Jefferson', listed in their order of fruit ripening from early June to very late July. White-fleshed peach varieties to enjoy include 'Nectar' and 'Georgia Belle'. They ripen a month apart from each other. A white-fleshed nectarine to try is 'Roseprincess'. In the coastal plain of South Carolina, where winters are mild, peach varieties that need less exposure to winter chill can thrive. If peach trees do not receive ample amounts of winter cold, a process called vernalization, flowering diminishes or does not occur. Therefore, low-chill peach varieties find favor around Charleston and Hilton Head. 'Flordaking', 'Junegold' and 'Harvester' all produce yellow-fleshed fruits. 'Flordaking' fruits ripen in early May. Recommended nectarines for coastal South Carolina include 'Armking' and 'Fantasia'.